September | 2014 | Linden Optometry A P.C. 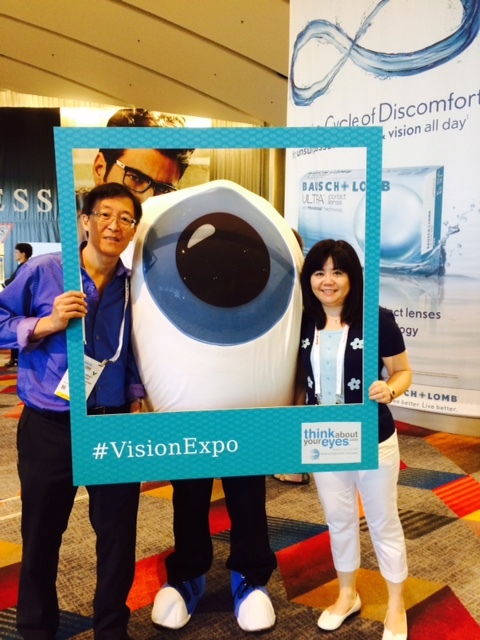 Dr. Limfat and Dr. Linden with Garry the Giant Eyeball at Vision Expo West in September 2014. Dr Alan Limfat, OD and Dr M. Emily Linden, OD pose with “Garry the Giant Eyeball” at #VisionExpo West, the world’s largest Vision Care Conference, after completing a grueling 21 hours of Continuing Education classes over 2 days! Most of Dr. Limfat’s and Dr. Linden’s coursework focused on the newest techniques to diagnose and treat Glaucoma, a disease which can slowly take your eyesight without early symptoms. Dr Limfat and Dr Linden are two of over a dozen Linden Optometry doctors who are certified to diagnose and treat Glaucoma. Garry the Giant Eyeball (pictured above) is the official spokesperson for Think About Your Eyes, a national public awareness campaign, presented by #TheVisionCouncil and the #AmericanOptometricAssociation, designed to educate the public on the benefits of vision health and promote the importance of getting an annual comprehensive eye exam. Just like you regularly care for your car and maintain your home, you can also care for your eyes to keep seeing your best.